You will need: Pencil, penny, bowl, water. SCIENCE EXPERIMENTS & AMUSEMENTS FOR CHILDREN BY CHARLES VIVIAN. Simple Technical Steped Practical Projects for school and college students. You will need: Pencil, penny, bowl, water. When rays of light enter another transparent substance they appear to bend, and this is called refraction. You can see refraction at work if you dip a pencil into a bowl of water. Only immerse part of the pencil and you will notice that the pencil seems to bend. Use refraction to play this trick on a friend. Seat him at the table and place a penny in a solid empty bowl so that it is just out of his view, hidden by the rim of the bowl. 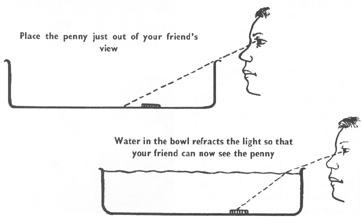 Tell your friend that you can bring the penny into view without his moving and without moving the bowl or the coin. Pour water gently into the bowl, so that the coin is not disturbed. As the bowl fills, the refracted rays of light will gradually make the penny appear to float into view.